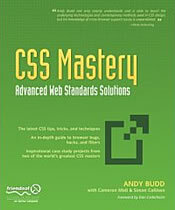 Back in May, I read Andy Budd’s book, CSS Mastery: Advanced Web Standards Solutions. I wrote a review after reading the first two chapters. I think it is the most practical and helpful book I have worked through on CSS. Last week, I started working on changing GodSquad.com from using tables for layout to CSS. I have been wanting to move in this direction for quite awhile now and thought I would do it as part of a redesign of the site. But I continue to be stumped in that creative process so I finally decided to move the current design into CSS. As I was working on a CSS design last week, I ran into some trouble where the site rendered correctly in Firefox but not in IE6. Reality is that most people are still using IE6 so I have to come up with a design that works well in it. I was really frustrated. I had some inkling that the problem was caused by the way IE renders “padding” but I was not sure I am far enough along in my CSS skills to diagnose the specific problem. I started thumbing through Andy’s book and reviewed what I had read. I have not been able to use the knowledge I had gained in reading the book in May. I had to turn my attention to working on support for our ministry at the end of May and beginning of June. Then at the end of June, I took a month of classes through Campus Crusade’s Institute for Biblical Studies. It was good to review the book because I realized that I could do a lot cleaner coding with the GodSquad design I was working on. I came up with a plan to do the structure a little bit differently. And I learned some tricks that would allow me to change the layout of a page using the body property. But I still did not have a solution for my main problem. But I did some tinkering and got it to work. I think it might have been Spirit inspired as I had prayed about my problem and asked God to help me with a solution. All this is to say that it just brought me back to the fact that Andy’s book is one of the best that I have seen on CSS. I read your review about “Css Mastery”. I recently order the book “the zen of css design” since iÂ´ve eard very good reviews about it, and iÂ´m asking you what is the most complete and practical reference between the two books. Since you review has so good about it, i has wondering if should by this to. In my opinion, Andy Budd’s book is the more practical of the two books. I think they are both great books but I found more info in Andy’s book that I was able to immediately apply to my work. Zen Garden has some great tips and has a lot of design principles and philosophies sprinkled throughout it. I have been reading it off and on since August. I think they have some good examples and there are things to learn from it. One thing I really liked about Andy’s book is that he starts off by reviewing the CSS Box Model. It is one of the best explanations that I have come across and cleared up some misunderstandings that I had. I think that I got most of my value out of the first 2 chapters of his book and now I am going back and looking at specific uses. Just last week I reread his section on styling tables and put it to use on a project. I recently purchased Transcending CSS which takes the next step from Zen Garden. Molly H. who contributed to Zen Garden also contributes to this new title. I am looking forward to diving into it soon.